"Paper piecing is so much fun! 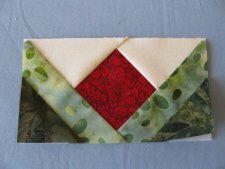 You can create amazing designs, or simply use one of the many blocks available. I LOVE Carol Doak's 300 Paper-Pieced Quilt Blocks! It has tons of wonderful blocks and the possibilities are infinite. The book comes with a CD so you can print the blocks you like when you are ready to start your project. "I print a few blocks, then cut and paste them onto a page so I can get as many blocks as possible (sometimes 2, sometimes 4, depending on block size) on one page, making sure I leave about 1/2" between blocks on all sides. Once that is done, I print the page onto foundation paper (vellum paper), and cut each one. 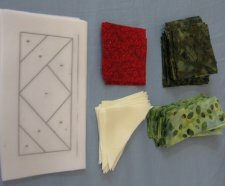 Then, I choose fabrics, cut them per her cutting instructions (Carol Doak tells you the size for each piece - little fabric waste! ), and put it together. This is another must-have book for your library. Now, on to the tutorial."